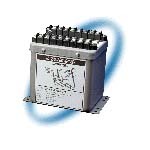 Power Line transducers provide an analog DC output proportional to the AC input received from the secondary side of a potential and/or current transformer. Most models are UL/CSA recognized under File E60579 and exceed IEEE472/ANSI C37.90.1 surge withstand capability test. In addition to the 2469/2489 metal case transducers, the manufacturer also offers a wide variety of plastic case transducers which may be mounted on DIN rail, along with terminal blocks and relays. The 2280, 2370 and 2460 series transducers offer versatility and compactness when space may be a concern. Both the 2370 and 2460 transducers normally offer 0.5% accuracy and come in one uniform case size from AC Amps to 3 phase 4 wire Watts or Vars. N/A, 2 Dart Road, Newnan, GA 30265. Tel: 770-253-7000; Fax: 770-254-0928.